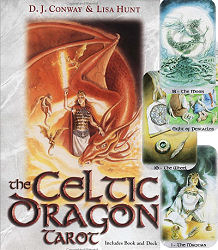 The Celtic Dragon Deck & Book set- Dig into ancient Celtic lore as your magic and divinations bask in the fiery breath of The Celtic Dragon Tarot by D. J. Conway and Lisa Hunt. Using her knowledge of ancient dragon energies (she wrote the popular book, Dancing with Dragons), D. J. Conway has designed one of the most vivid and powerful Tarot decks ever. The art for this deck was created by the well-known fantasy illustrator Lisa Hunt, and will bring chills to your spine. The Celtic Dragon Tarot is a set that combines a full-color, 78-card deck and a 240-page book, A Guide to the Celtic Dragon Tarot. Together, they can empower your readings, your magic, and your heart. No words can express the beauty of this deck. 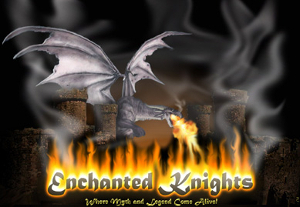 The amazing attention to detail on each card, from delicate scrollwork on clothes to the intensity of the expressions on the people and many different images of dragons, will astound you. The book gives you everything you need to know to make The Celtic Dragon Tarot a part of your daily spiritual and magical work. ·Complete explanations of the symbolism on each card ·Divinatory meanings for each card ·Four Tarot spreads that you can use to do readings for yourself and others ·Spells using candles and this deck for healing, luck, protection, love, and more ·How to meditate with this deck, including three guided meditations ·Understand past-life influences on the present ·Develop psychic abilities The Celtic Dragon Tarot is an exciting new addition to your magical life. Whether you are interested in the Tarot, the Celts, magic, or self-improvement, this book and deck are a must.